Is it taboo to post a pie recipe immediately after Thanksgiving? Is pie even consumed after Thanksgiving, or are we squarely in the cookies and cocktails part of the holiday season? 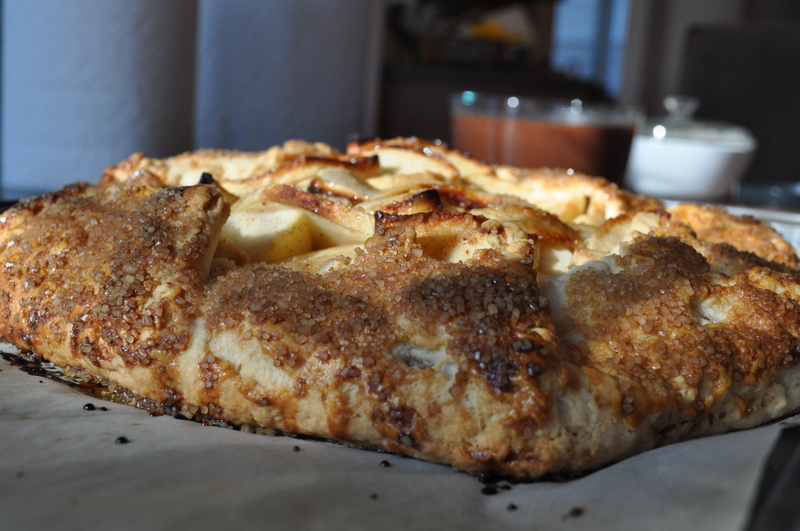 And then on top of that, it’s an apple recipe, which is obviously an October treat. We’re out of the cinnamon part of the season, and on to the gingers and caramels. Right? Am I reading too much into this? I’m so off-season with this recipe! But I must share. Because 4 ingredients (+ some water) made the best pie dough I’ve ever had. So good, in fact, that I made this crostada twice last week. Once pre-Thanksgiving, and one the day after Thanksgiving, because, quite frankly, I missed it. It was gone so quickly the first time, that I felt we needed another one, immediately after consuming a Thanksgiving meal. 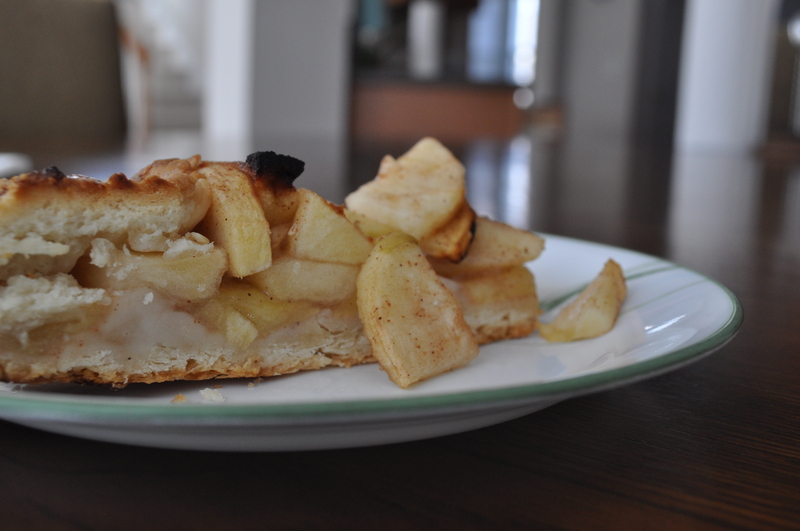 That flaky, buttery pie dough combined with the obviously sweet, spicy flavor of softened apples. I mean, I have nothing else to say but to put aside holiday rules and make this immediately. If not for a holiday party, then for breakfast tomorrow. You won’t be able to get enough of it either. Place flour, salt, and sugar in a food processor; pulse to blend. Add butter; pulse just until coarse meal forms. Add 1/4 cup ice water; pulse until dough forms clumps, adding more ice water by teaspoonfuls if dough is dry. 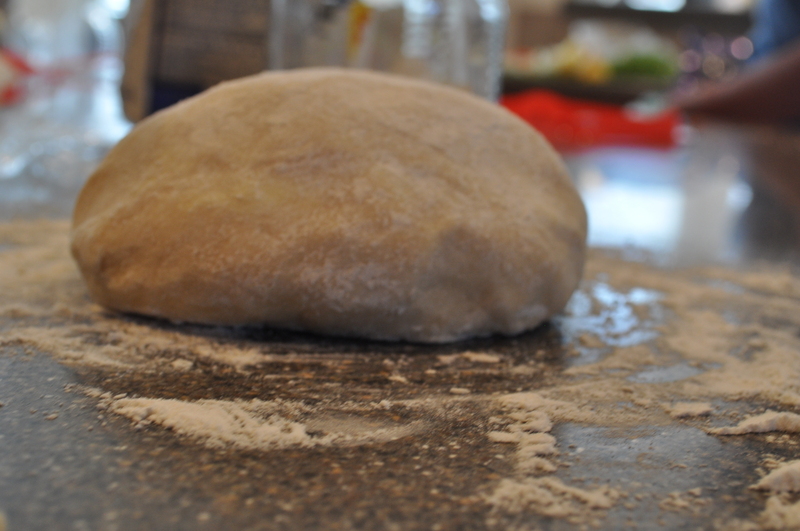 Gather dough into a ball; flatten into a disk. Wrap dough in plastic and chill 1 hour, or up to 1 day. If doing it by hand, work the butter into the dry ingredients by hand, or with two forks until the butter is pea-sized, and then gently stir in water with a wooden spoon. While dough rests, place a large sheet of parchment paper on a work surface. Roll out dough disk on parchment paper to 15″ round (some of dough will extend over edges of paper). Whisk sugar, cornstarch, cinnamon, nutmeg, and salt in a large bowl. Add apples and lemon juice to bowl with sugar mixture; toss to coat apples evenly. Let the filling sit for about an hour. Preheat oven to 400°F. Transfer apples to crust, mounding in center and leaving a 3″ plain border, leaving the juices in the bowl. Fold crust edges up over outer edges of filling, crimping dough and folding and pleating as needed to fit. Slide crostata and parchment onto a large rimless baking sheet. Crack egg into a small bowl. Using a fork, beat egg with cream, just to blend. 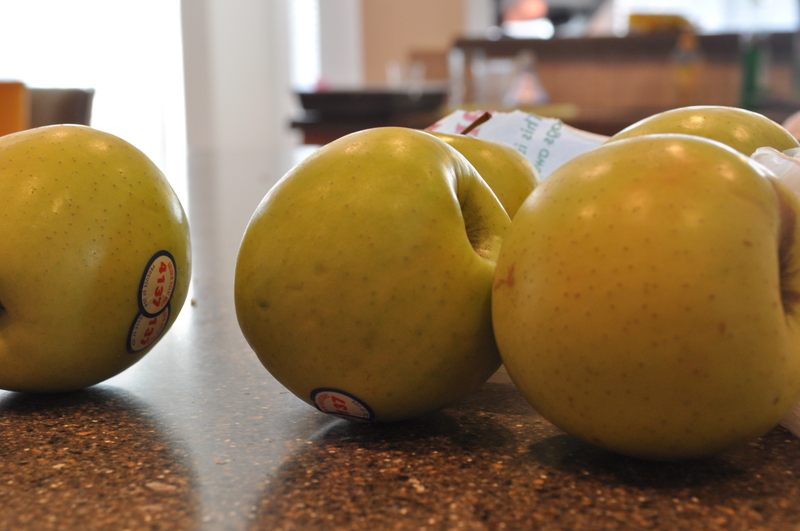 Brush crust edges with beaten egg, then sprinkle crust and on top of the apples with the raw sugar. Place crostata in oven and bake until juices in center are thick and bubbling, about 45 minutes to 1 hour. Let cool for 5 minutes. Run a long, thin knife or offset spatula around edges of crostata to loosen from paper and to prevent it from sticking to the paper. Transfer baking sheet with crostata to a wire rack. Slice and serve. This entry was posted on	December 5, 2014 at 12:01 pm	and is filed under Uncategorized.